Introducing the BIGGEST robalo ever. The biggest Robalo ever is here. 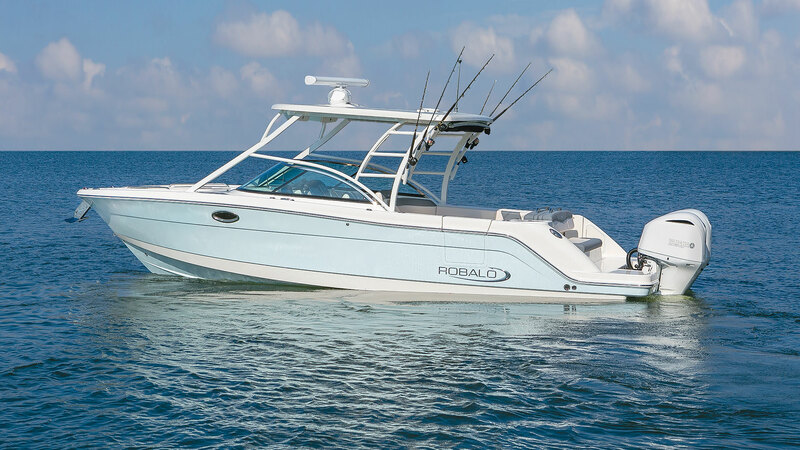 The R317 has an overall length of 31 feet making it not only the largest Robalo afloat, but also the largest dual console Robalo. A perfect blend of versatility for both the die-hard fishing enthusiast and the family minded angler. 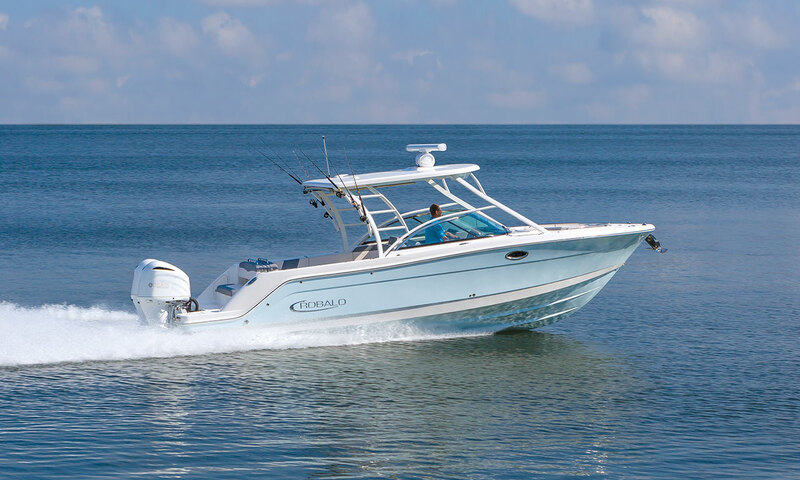 Sleek lines and loaded with standard features, the R317 is the boat you have been waiting for. For the family minded angler, the R317 goes above and beyond for comfort. A large head compartment is located under the helm station complete with storage, a sink and a toilet. The head compartment is accessed from the starboard bow behind a concealed door. 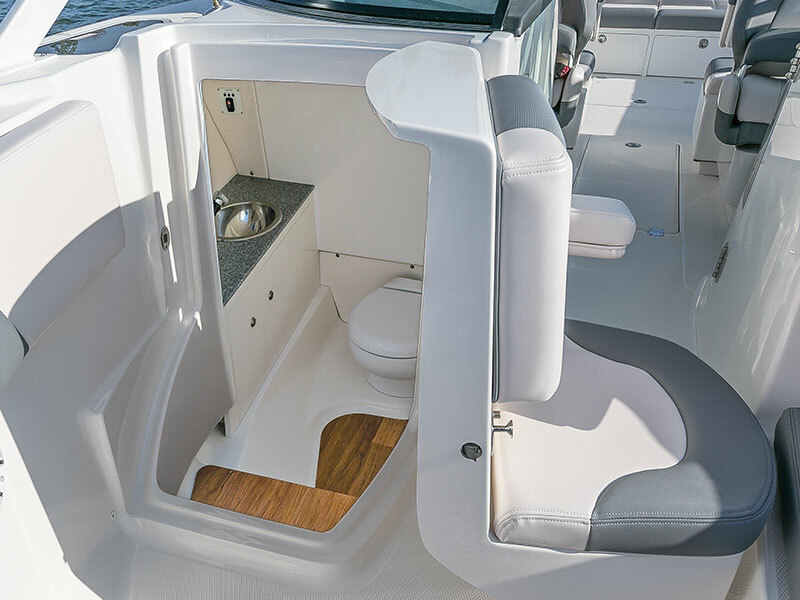 The cabin is accessible from behind the portside helm and features a full fiberglass liner, opening port light, secure rod storage, and a sleeping area perfect for the young ones to escape from the sun or take a nap. 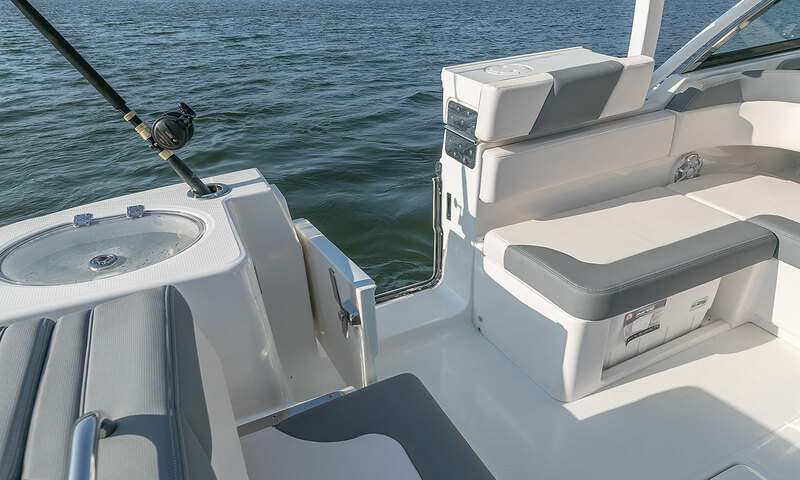 Turning to the fisherman in the family, the R317 is equipped with a huge 50-gallon fish box under the aft seats, rod holders, a 36 quart removable cooler, and a 25 gallon cooler/livewell with LED lighting and clear plexiglass lid. The R317 is available with the latest in innovative features. A huge integrated walk-around swim platform and side entry door makes entry and exit a breeze. 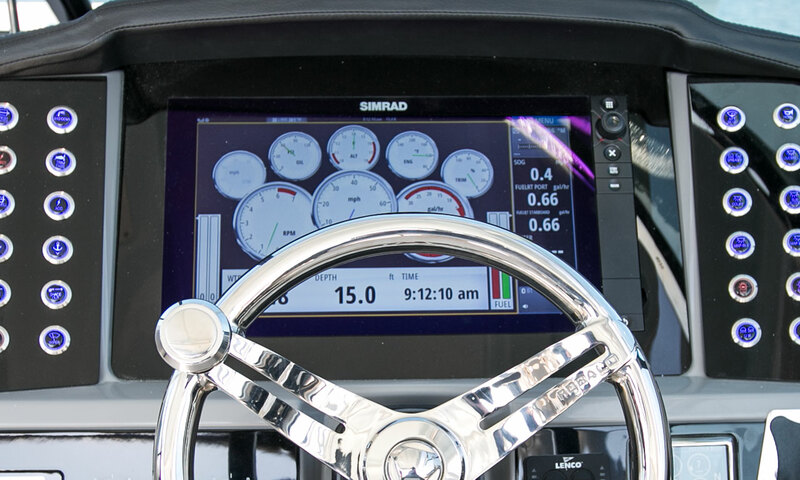 The helm station features a standard 12” glass dash with a 16” screen upgrade available. Push button backlit switches are arranged in highly polished acrylic panels. 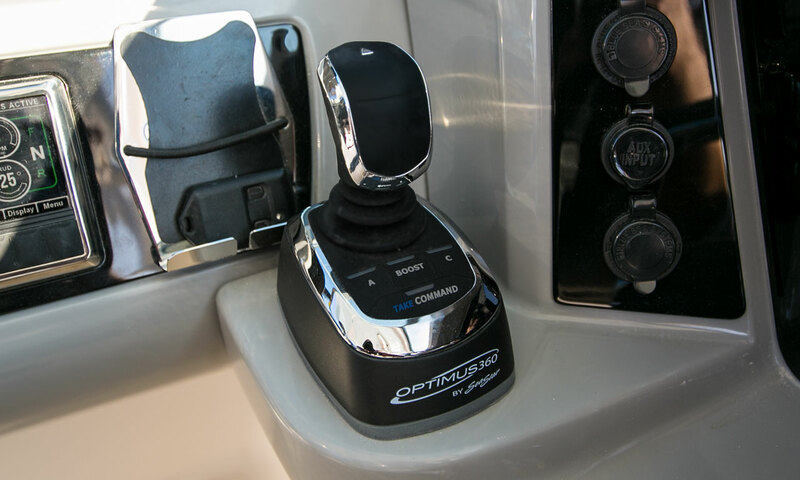 Stereo remote, power supply, and auxiliary stereo inputs are at your fingertips. A stainless steel steering wheel and hand stitched sun visor complete the compliment. The R317 is available with the optional Optimus 360 joystick docking system making maneuvering in tight spaces safe and simple. With standard 600 horsepower from twin outboard engines, the R317 jumps onto plane and has a top speed that can get you where you want to go in a hurry. Four-stroke fuel injected technology combined with the Robalo Hydro-Lift hull maximizes efficiency. 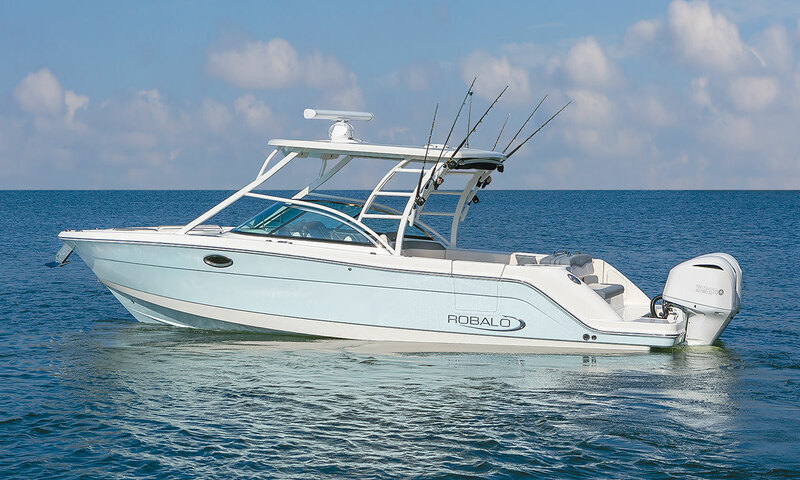 The R317 combines the durability and toughness Robalo is known for with the comfort and luxury of a sport boat. Starting aft you find our patent pending Vista-View Lounge Seat. 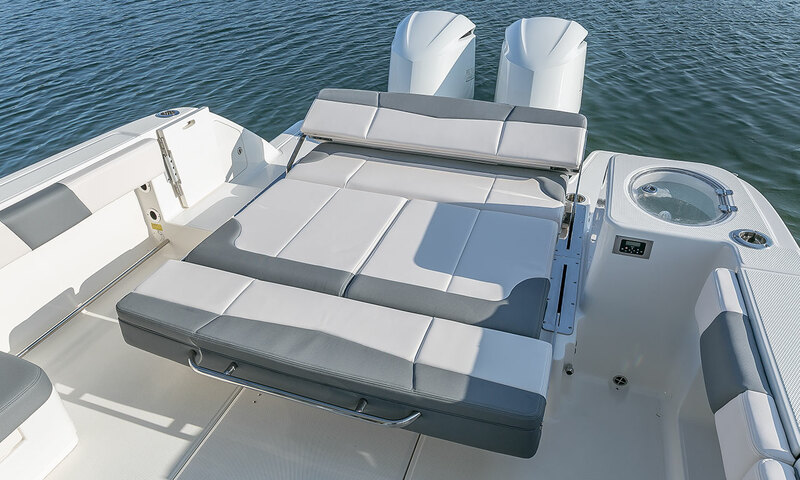 Press the button and the dual backrests pivot effortlessly and silently to your optimum backrest position, or lay completely flat to create the largest sun lounging pad in any dual console on the market. The open concept seating in the cockpit seats everyone comfortably around a standard removable cockpit table area. Moving forward port and starboard feature double helm seats on both sides. 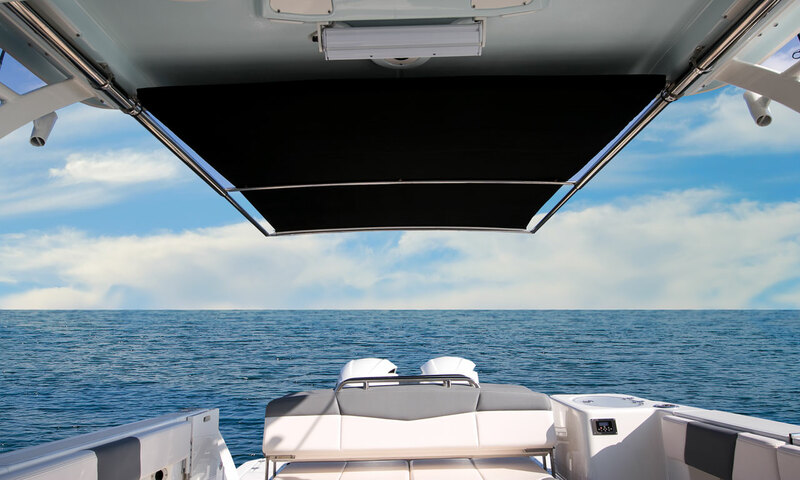 Overhead you will find the powder coated oversized fiberglass hardtop with integrated LED lights, rod holders, storage, and optional SureShade retractable sunshade. 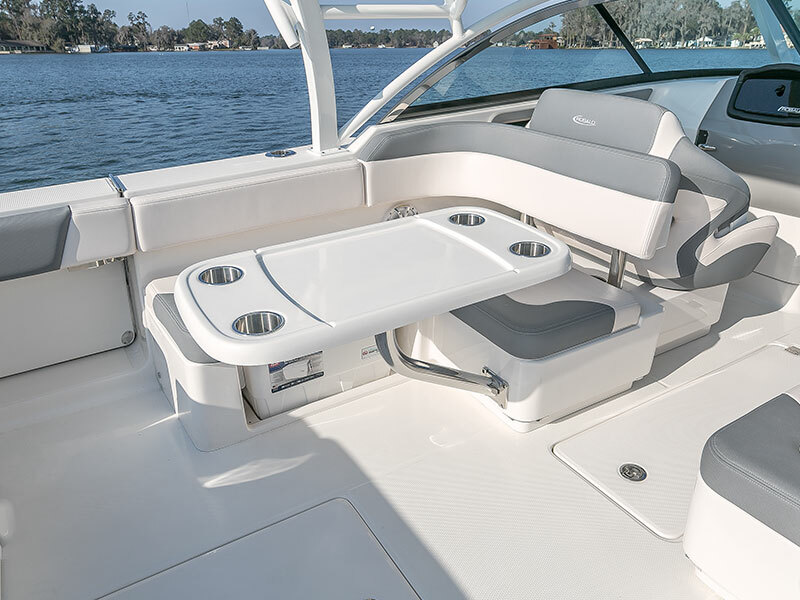 The bow has an L–shaped seat to port while a single seat starboard neatly conceals the head access. 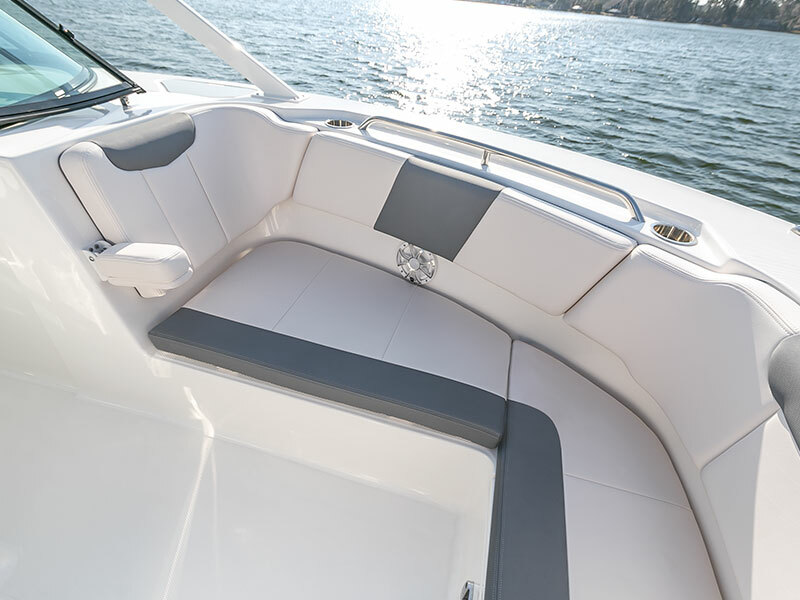 Throughout the R317 all upholstered areas feature rich, durable, accented vinyl. 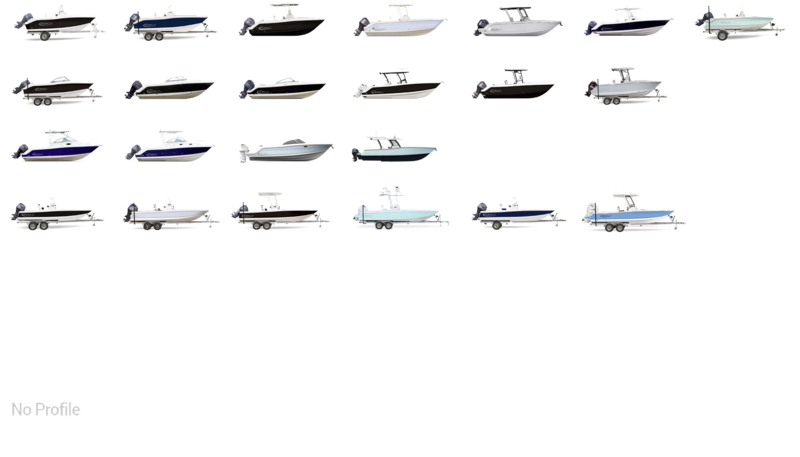 Our hull design utilizes an extended running surface, allowing the "v-plane" to continue aft of the transom. This creates superior stability under nearly all driving conditions. Less time at the pump means more time in the water and more money for bait. The hydro-lift provides a quick plane time, creating one of the most fuel efficient boats in their class. A fishing trip feels like a day cruise when you're out on a Robalo. Engineered by the best for the worst of conditions, you will feel the difference that hydro-lift provides. The extended running surface coupled with the tight aft hull corners delivers everything you need when you're taking sharp turns. These hulls drive like a luxury automobile. 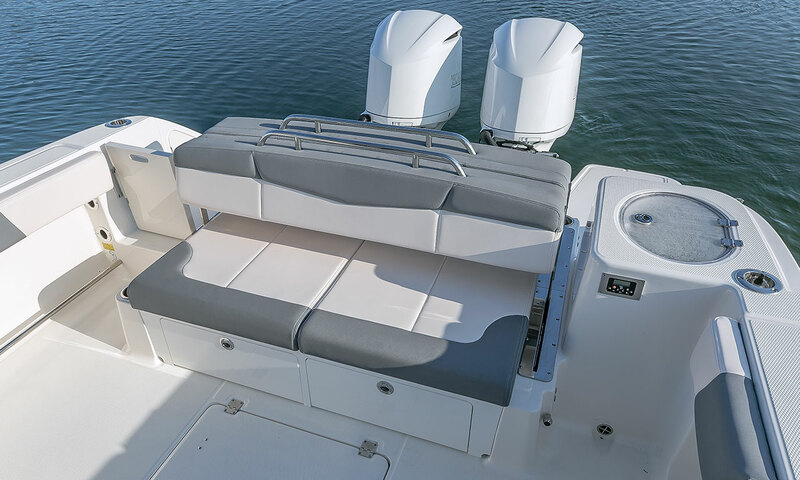 Enjoy dry comfort aboard any Robalo due to our high freeboard. Feel secure in the deep cockpits. You'll be amazed at the size, all while maintaining a sleek profile. With a forward keel designed to cut through the water like a knife, high-octane pleasure awaits. Quick acceleration delivers the ride of a lifetime each time you leave the dock.